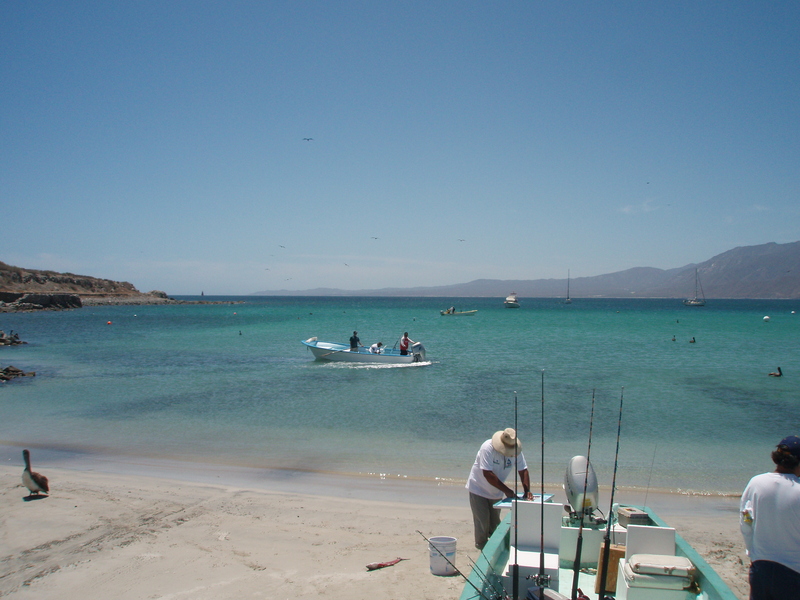 The view from Bahia de Los Muertos where we launch every day for the fishing grounds. Despite the great sunshine and seemingly tranquil waters, just beyond the point, many of the days were pretty choppy. Fortunately, fishing is close! Sierra…the speedy toothy gamefish that makes great sport and tasty ceviche was our mainstay for the week like this guy that Tim’s holding in front of the camera. Light tackle is great for these guys that can get 3 times this size. Commercial fishermen started getting into some of our seasonal yellowtail this week as shown by some of the catch laying on the beach. Unfortunately, we were doing more fishing than catching as the powerful jacks we hooked all broke off. Yes! 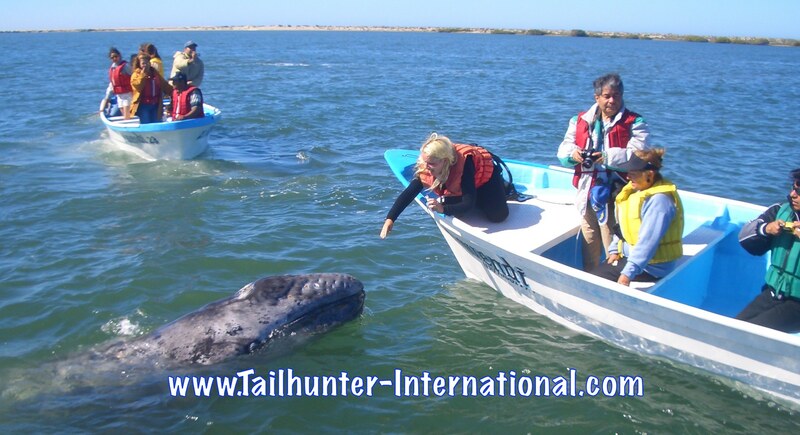 Whale watching season is back at Bahia Magdalena and we’re running daily trips out to see these great creatures in th calm bay waters! The whales are usually here until mid-March so let us know if you’d like us to set up a tour for you! 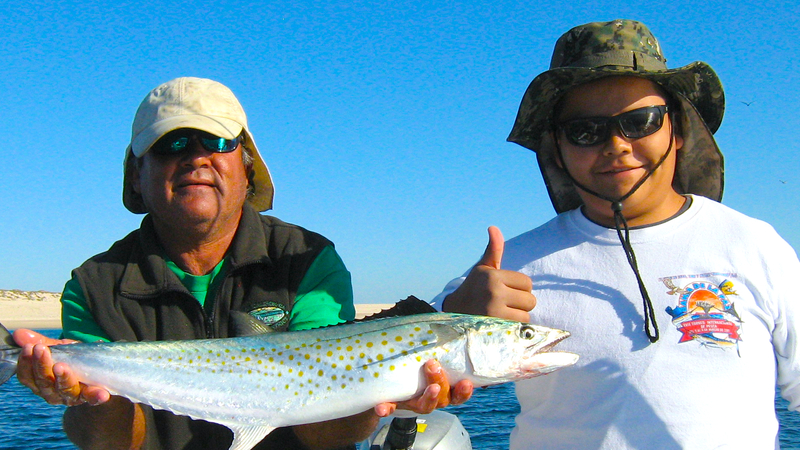 This past week was more typical of winter fishing in La Paz. In a word…WINDY! Northern winds kept things blustery, cool and bumpy on the water, but fortunately, being the off-season, there weren’t that many fishermen on the water and those that did fish this week have fished during this time in the past and knew what they were going to encounter or, in the alternative, were happy just to get out into some sunshine! It was sunny, no doubt and temperatures were in the 70’s, but windy by our standards and cool as well. But for folks from Canada and the mid-west, they were just looking for a day out on the water in the sunshine! As for fishing, again, typical of this time of year when the winds blow. 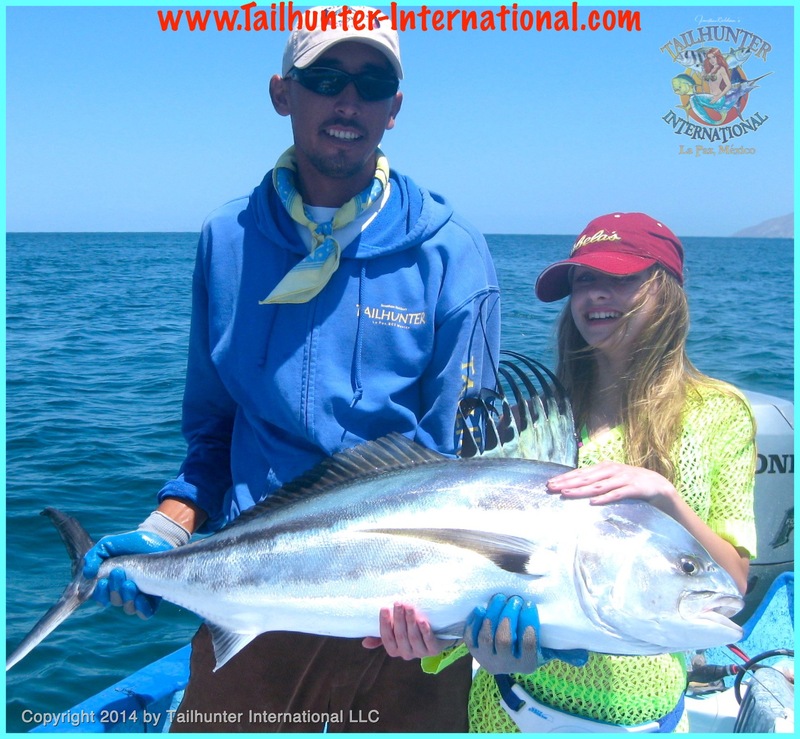 Sierra provided the most action inshore along the reefs and beach drop-offs. In the rock areas and reefs, smaller pargo, snapper and cabrilla (sea bass) were willing to bite chunks of dead bait like squid. We know there have been dorado the past few weeks, but nothing came up this week in the usual areas made more difficult by the bumpy waters. However, we did have some yellowtail and larger pargo hooked and lost. It’s sort of a double whammy. 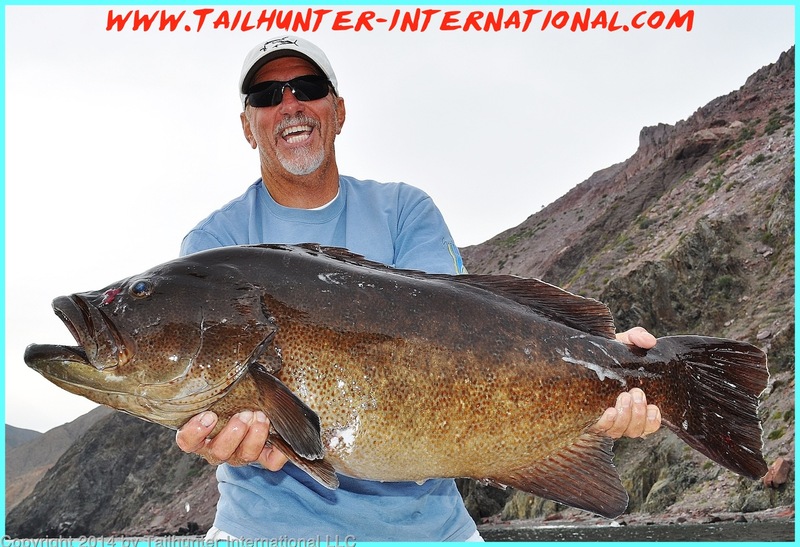 These fish are the season trophy fish and mean as heck and powerfully built with attitude. Rookies or folks not ready to put some bend on these fish are quickly schooled when the fish power back into the rocks and the line breaks. Still, it’s very encouraging to know these bad boys are in our waters! THANKS WASHINGTON! TAILHUNTER NOW GOES TO PORTLAND! So many friends visit us in our Tailhunter booth like John and Dolores Ehlers, our amigos who have fished with us for many years, but represent Eagle Point Lodge in Alaska. We just had a great week of shows in Washington and now head for Portland, Oregon! We just wrapped up our third show of the tour season with an incredible show at the Washington Sportsman’s Show at the Puyallup Fairgrounds between Seattle and Tacoma. It was five incredible days and great to see so many of our amigos and tons of reservations for fishing with us in La Paz in 2014! We’re excited to welcome so many new folks and old tribal members who are coming to fish with us this year! Thanks to all who visited! We had some surprise roosterfish this week like this one that Cheyenne Wenholz took what we estimated to be about 45 pounds… a big fish for the 13-year-old first timer from Aurora, Colorado! It’s a big fish for anyone. A nice trophy! And best of all…she released it! But she did it all by herself just off Punta Perrico with only some help from our Captain Pancho to take the photo! Another surprise biter this week! 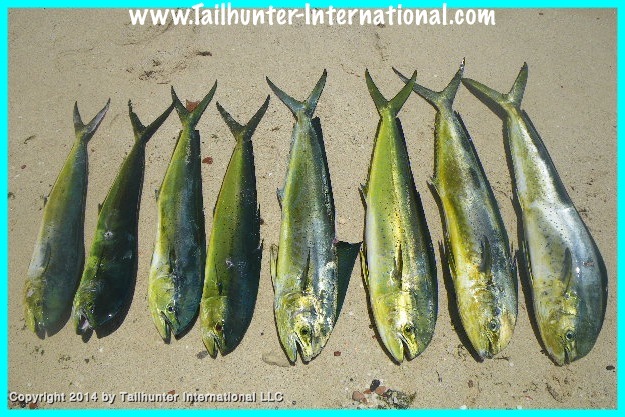 Who would have thought we’d bee seeing a rack of dorado like this on the beach after a day of fishing…IN JANUARY! But, late in the week schools of 10-15 pound mahi went on the chew! 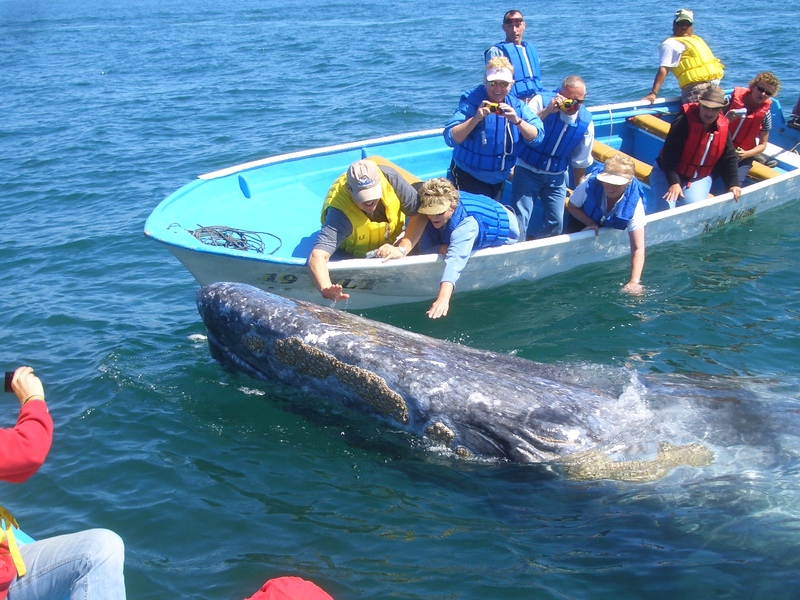 The whales have officially arrived now in Bahia Magdalena and it’s a great time to see these great animals in the warm shallow waters of the bay where they’ll usually remain until mid-March or so! 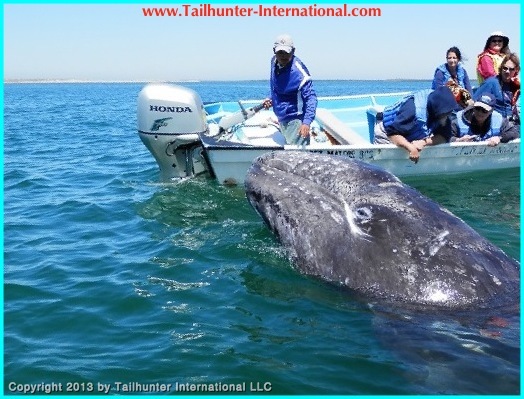 It’s a once-in-a-lifetime experience and Tailhunters is now running it’s daily trips out to see them! It was not the best week for fishing this past week. Well, maybe the fishing would have been better if it hadn’t been windy! It was pretty stiff this past week so fortunately, we didn’t have too many anglers and those we had, we were able to have them put off their fishing until it got calmer. As the week wound down, the winds diminished and we were able to get out. I told the anglers that most likely with the cooler temps and off-color water, they would find some action with maybe some bonito…some snapper…maybe some sierra. Indeed, they did get those species which are typical of this time of year in the winter. However, again, with the surprises! We got into dorado again! I have no idea why dorado would still be hanging out, but some really fun 10-15 pound school-sized fish showed up and were a real treat. Close to shore and willing to eat! This is pretty unusual to be getting dorado this time of year, but no one complained! As well, I guess we still have rooster fish in the area also! It’s again normally a fish we don’t see in January, but such a popular exotic fish that everyone wants to try for one. So when they do happen to pop up, it’s a bonus. We hooked and released several 30-40 pound fish off Punta Perico. Also, heads-up…some of the commercial guys are starting to get some yellowtail! Maybe the big jurel are finally here. Will keep you posted! TAILHUNTER TOUR WRAPS UP DENVER…NOW HEADED TO WASHINGTON! He’s a star! Young Grayson (“G-man”) Richmond from Evergreen, Colorado poses with me in our booth at the Denver ISE show! Grayson came down to fish with us in La Paz this past season and just tore it up! He even made the cover of our latest Tailhunter brochure! Just finished tearing down the booth at the Denver Convention Center where we had a blast visiting with all our old amigos and making new ones every day! 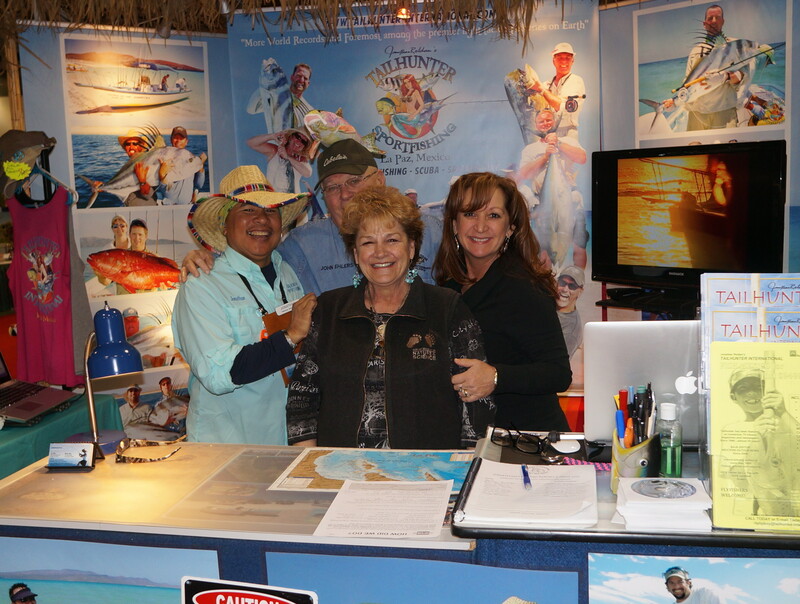 It was a great show and we got lots of folks signing up for their 2014 fishing vacations with us and we’re really looking forward to the visits! So, now we’re on the road again. And this week, we’ll be hitting the Puyallup Fairgrounds in Washington just outside Seattle for the Washington Sportsmens Show that starts Wednesday and goes to Sunday January 22-26th. The show is ALWAYS packed and it’s our first show of the year in the Pacific Northwest. Come say hi and check out our new 2014 brochure. 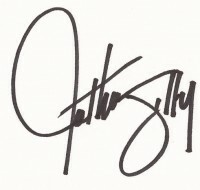 Pick up a free DVD as well plus take a look at our new line of t-shirts and hats that Jilly designed. 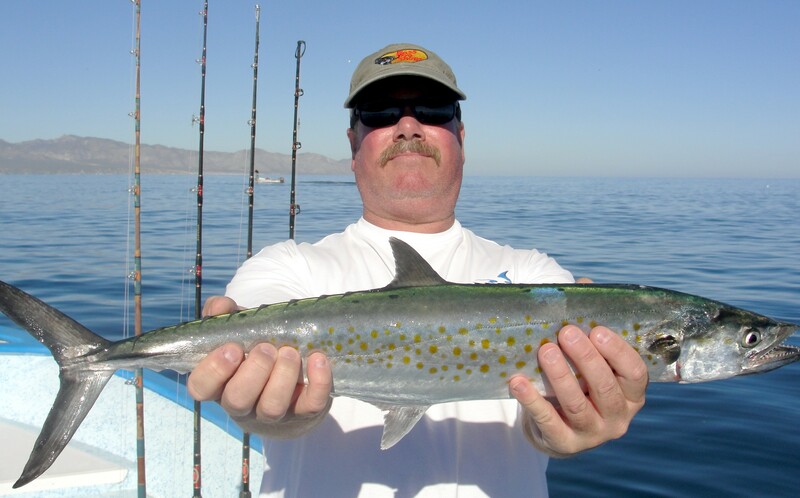 We can also set up your La Paz fishing vacation for this year! Come put your toes in the sand! We’ll hopefully see you this week! Dorado in the winter? That was a big surprise this week as a number of our anglers got into the dorado not too far off the beach near Bahia de Los Muertos. 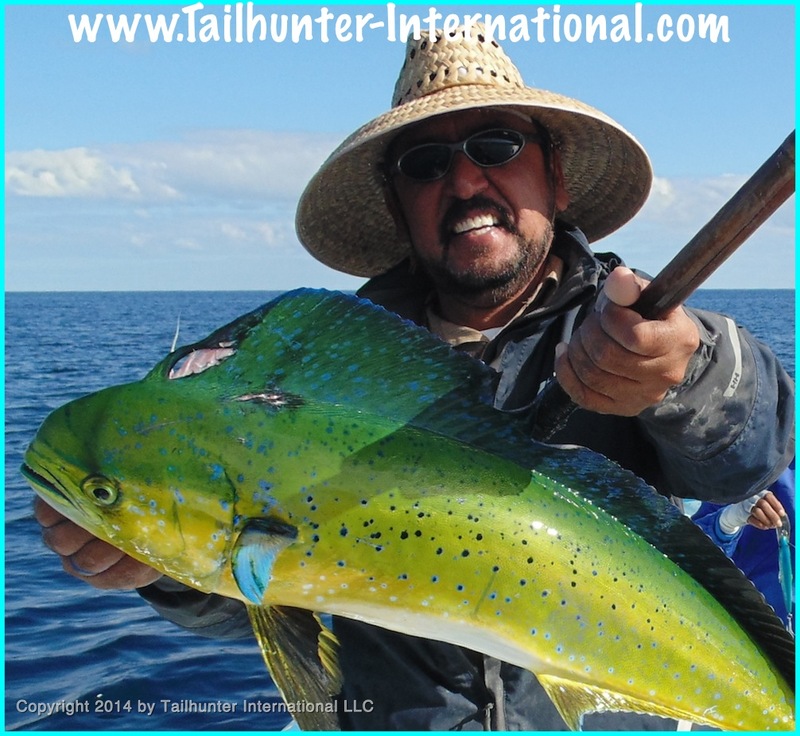 Captain Jorge with our Tailhunter Fleet shows off the kind of fish we were catching! More typical of our winter fishing are the schools of sierra that come up into the shallows and make for great light tackle fun plus great eating like this one taken just off the sand at Punta Arenas. FISHING REBOUNDS…SOMEWHAT NICELY AFTER HOLIDAY SLOWDOWN! The fishing rebounded somewhat from the slow windy week we had the previous week to start the year. The key really seemed to be the winds. They can get pretty blustery this time of year and there’s usually a direct correlation between winds…the number of fish caught…the types of fish caught…and definitely the number of anglers out there! But, this past week the winds were at least a tad more forgiving and as might be expected, there was an upswing in the fish. The surprising thing was that we didn’t get the type of fish we might expect this time of year. 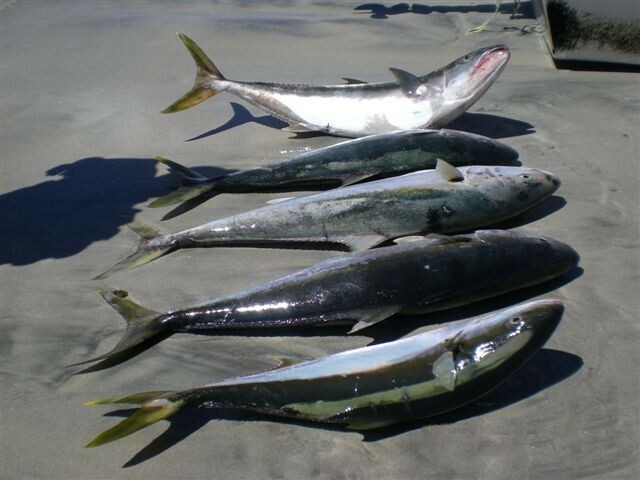 Normally, we see inshore fish like sierra, and cabrilla (sea bass), bonito and jack crevalle. And yes, we did get some of those! But, what really surprised me were the dorado that showed up! Yea…that’s right, dorado. A real treat since dorado tend to always be warm water fish and the type of fish we get in the summer and warmer months of the fall. Not winter! Anyway, a nice bonus with fish around 6-10 pounds. Nothing earth-shattering, but 3-6 fish per panga is pretty sweet for a day of winter fishing to be able to bring some mahi mahi back home to the ice chest and grill! TAILHUNTER ROAD SHOW GOES TO DENVER! 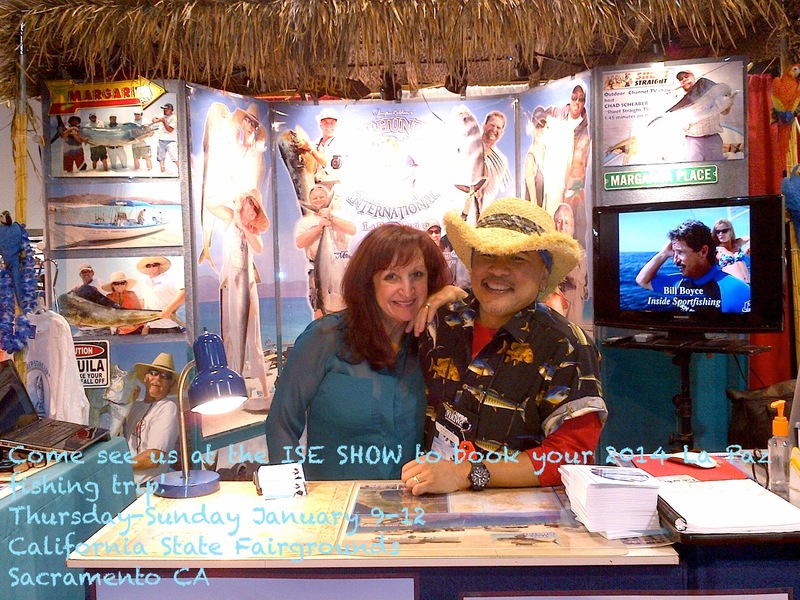 We had an incredible show this past week at the California State Fairgrounds at the International Sportsman’s Expo. So, now we take the road show and drive to Denver, one of our most favorite cities! We’ll be at the Denver Convention Center for 4 days with the show starting Thursday and going to Sunday. This is always a spectacular show with lots of great things for fishing, hunting, travel and the outdoors for the family to see. 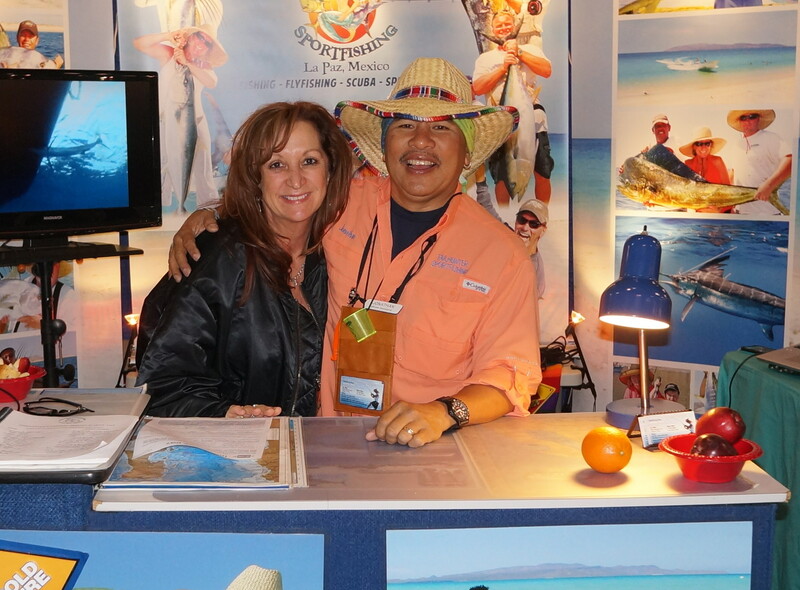 Come spend the day and come visit our booth to talk to us about setting up your 2014 La Paz fishing trip! We’ve got a whole new line of hats and shirts too! See you in Denver this week…Jan. 16-19th! He’s a monster magnet! No matter the fishing, Roger Thompson always sticks big fish. He got this sweet cabrilla (Mexican seabass) off the north end of Cerralvo Island. The only had one day to fish and it was their first time with Tailhunters, but Annika and James Gervais found a nice little jag of dorado and got a limit of fish like these. People ask all the time for “larger boats” to catch blue water fish and “go further out!” Notice how close to shore the caught these dorado! I think the fish took the holiday weekend off. Honestly, it was scratchy fishing, at best. Cooler temps and windy conditions didn’t help. I think that was more of a factor then the good moon phase and it wasn’t enough to overcome the water and wind. There was still some good inshore action. 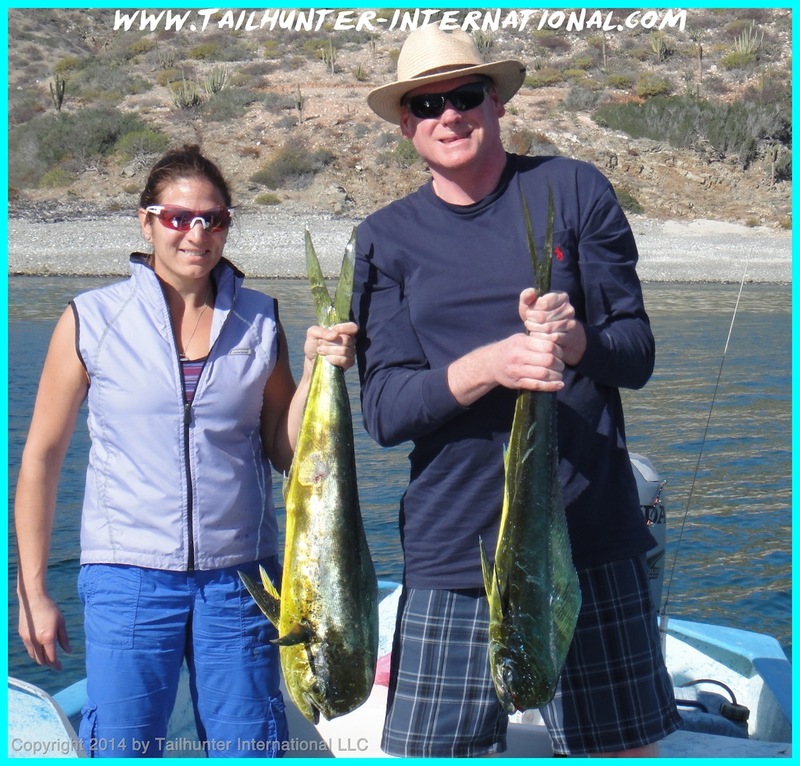 There’s still some dorado hanging out and some schools of 10 pounders were located pretty close to shore and a good spot for our pangas launching out’ve Bahia de Los Muertos near Las Arenas. Nothing, big but still some good light tackle fun and a nice surprise for winter fishing. For other species, there were some good jags of bonito. Not such great to eat, but not much tougher than hard-charging bonito to keep a rod bent and since we’ve had quite a few families during the holidays the bonito have been great for the kids as well as folks just looking for some action on the water and something to do…especially if they’re snow-birds from chillier places just wanting to enjoy some sunshine. There’s also some cabrilla (Mexican sea bass) that were in the counts. (Including the gem in the photos above that Roger Thompson caught off Cerralvo Island). Most of the cabrilla were little 2-3 pounders. Some rooster fish and decent numbers of sierra as well. No pargo to speak of and I would have to officially say that the great marlin bite of the past few weeks is probably done for the season. The traveling Tailhunter Booth! See you soon! We will be in Sacramento…Denver…Puyallup (Seattle)…Portland…Yakima…Phoenix…Boise…Long Beach…Salt Lake City and Del Mar (San Diego) between now and March! COME SEE THE TAILHUNTER BOOTH IN SACRAMENTO! 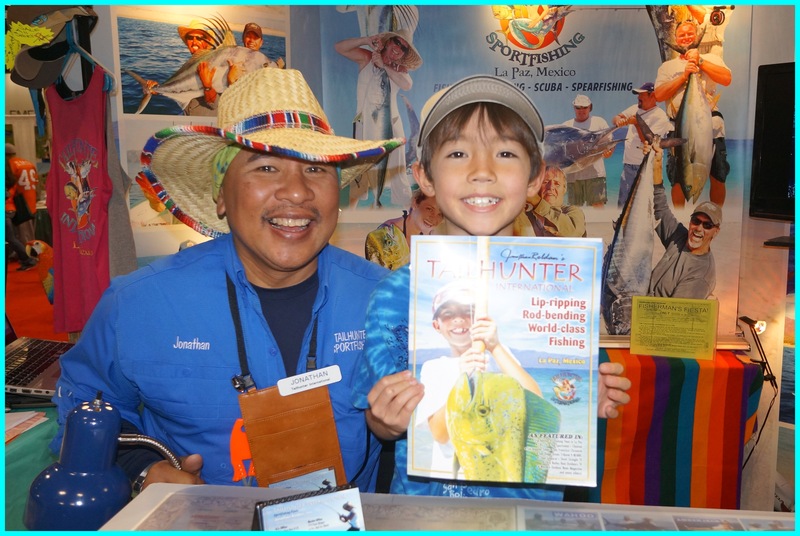 Our booth will be in our usual spot in the main fishing hall and we’re excited to visit with you. Sacramento is always a MONSTER show for us with the ISE. Here’s more info. Check out the video. Click the link! ISE SHOW COMING TO SACRAMENTO! That’s our story! Happy 2014 everyone!